How might Malcolm Turnbull’s life have turned out if he was sexually abused as a child, which caused him to suffer post-traumatic stress, making it difficult for him to get a good education and find a good job, leading him to part-time work on the minimum wage, failed relationships, living with his mother in a housing commission house and alleged drug-use. 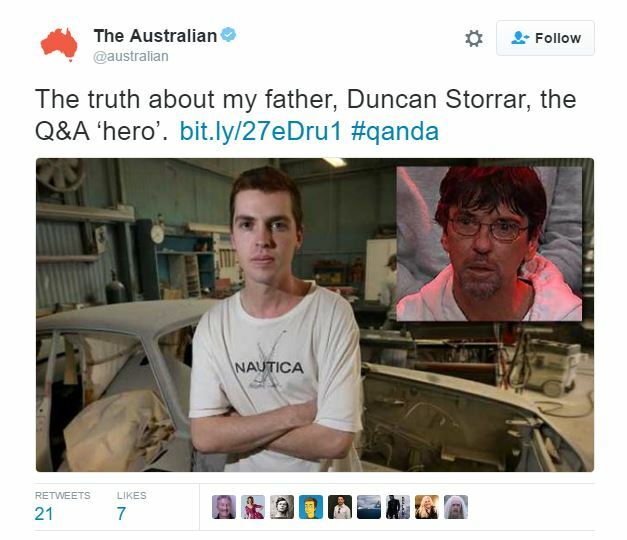 That’s Duncan Storrar’s life story who, in the space of four days, has managed to expose the callousness of neoliberal ‘trickle-down economics’ (through the callousness of Kelly Toaster-O’Dwyer and Innes you-don’t-pay-tax-and-therefore-you-are-the-scum-of-the-earth Willox), has been called a national hero, has had over $40,000 raised for him through community crowd-funding and is now being attacked by the Right through the depiction of his troubled past by his son, all because he wanted to take his daughters to the movies on the weekend. I can’t say how Turnbull’s life would have ended up had he walked in Duncan’s shoes. Maybe down-and-out Turnbull, who grew up in Vaucluse, might have managed to overcome the challenges Duncan has experienced, and would have still gone on to become a billionaire Point-Piper PM who allegedly invented the internet. But either way, we can learn a lot from the fate of Duncan versus the fate of Malcolm Turnbull. We can learn that if you’re poor, and you do something the community looks down on, such as take drugs, you’re written off as an evil untouchable. But if you’re rich, and you do something the community looks down on, such as the being the Director of a company putting your money in Panama to evade-tax, you’re still a hero. Of course there is a class war, and Turnbull is using all the resources available to him to smash the under-resourced Duncan to smithereens. The Right paints Duncan as a failure because he doesn’t pay any tax, yet when Turnbull and his rich company executive mates evade millions of dollars of tax using off-shore bank accounts and countless other tax-evasion ‘strategies’, he’s seen as smart and is admired for his cunning. There is a very simple reason for this inconsistency. The rich are untouchable and revered, a higher-class of being who we should all aspire to be like and never ever criticise if we don’t want to miss out on the trickling-down of their God-like wealth. The poor, the vulnerable and the sick, of which Duncan is all three, are, unfortunately, not given such latitude in the judgement stakes, and are belittled, spat on, written-off and by many, hated and blamed just for being poor. Australians like to think of themselves as a fair nation, and it pains me to say it, but the case of Duncan and the case of Malcolm this week shows that we are anything but. I personally found one of the most interesting parts of the Duncan story the fact that he voted Liberal in the last election. How many Duncans were responsible for the Abbott government? Hundreds of thousands, if not millions. Trying to work out why people vote against their best interests is a question for another day. It’s always been the case that the Liberals would never win an election without the Duncans of the world helping them along. There are comparatively few people in Turnbull’s electorate of Wentworth – the mansions take up a lot of space, but usually only have a few people living in them. This is the electorate, by the way, who benefit most from negative gearing, making an average net-rental loss of $20,248. Duncan earns $16 an hour as a part-time truck driver. The description of part-time isn’t really accurate – apparently he takes work when he can get it. I wonder how often he’s managed to earn $20,248 in a year, if ever. What was it about the Liberal’s election campaign which made him think – yes, they have my interests at heart, they will make my life better? It sounds like he’s learned the hard way that he was wrong about this and that really, Kelly O’Dwyer and Innes Willox and Malcolm Turnbull and anyone who works in the Liberal government and helps fund the Liberal Party don’t just care little for him, but actually resent his very existence. How many other Duncans got a slap-in-the-face from the Abbott government, and in turn, the Turnbull government, and vow never again to make the same mistake? Willox helpfully pointed out to Duncan that every budget has winners and losers. I wonder if the Duncans have noticed when it comes to Liberal budgets, the working class always lose. Duncan has been quoted as saying ‘The only thing that will help my children out of the poverty circle is education’. I hope he’s checked out the education policies of Labor compared to Liberal, to show which party promises to increase funding for education, and which is slashing and burning his daughter’s future. Duncan might not be a perfect father, he might not be revered as the working-class hero the community thought he was. But Duncan has struggled, understandably, through his life and just wants a better go for his children. I think lots of Australians can relate to that. Well said as always, have shared on Facebook.